It all began innocently enough with advice from his mother. “Get a job where you have to talk”, she said. And Ted Reynolds talked his way to becoming one of the country’s most recognized names in sports broadcasting. That advice kick-started a career that would last 45 years. Another former colleague, Don Brown who produced many of the sports broadcasts Ted was associated with, listed 23 different sports that Ted covered. That’s just six fewer than the 29 that are listed as the official sports of the Summer Olympics. A multi-award winner for excellence in his work and contributions to his craft, Ted Reynolds is a two-time recipient of the Doug Gilbert Media Award and is the only media member in the Canadian Aquatic Hall of Fame. 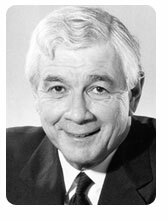 He is well remembered for his coverage of major aquatic events on CBC TV over a span of 30 years. Swimming coverage provided him with two of his greatest moments over a 45-year distinguished career in broadcasting. “I called every race of Mark Spitz’ remarkable seven gold medal Olympic performance in Munich in 1972. Also witnessing and calling Canada’s first gold medal in Olympic swimming – one of two won by Alex Baumann in 1984 – after waiting so long.” (Canada’s last swimming gold had been in 1912). Now, aren’t you glad you listened to your mother, Ted.